Pork tenderloin marinated in spices and apple juice to create a mouth-watering barbecued pork that’s slightly sweet, spicy, tender and juicy. 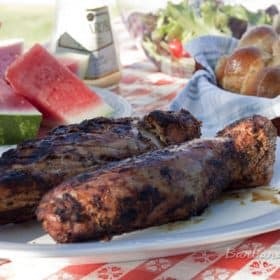 Memorial Day is the start of the BBQ season and one of my favorite meats to BBQ is pork tenderloin. It cooks quickly, is juicy and tender and feeds my crowd. Tree Top sent me some grilling tips and a recipe for Doc’s Tenderloin Rub. Since I love tenderloin I decided to give it a try. I adapted the recipe to the spices I had on hand, marinated it 4 hours and the boys and I had a picnic in the backyard. It got a thumbs up from all of us. Do you like to BBQ on Memorial Day weekend? Mix together spices (I mixed them in a Ziploc bag.). Rub spice mixture all over tenderloin. Pour apple juice over tenderloin. Rub in so the apple juice wets the dry spices thoroughly, add more apple juice if needed. Put tenderloins in a Ziploc bag and marinate 4 hours or overnight. Keep refrigerated. Heat grill to high. Place tenderloin on the hottest part of the grill. Cook turning occasionally, until well browned on all sides, about 10 minutes. Reduce temperature to low and cover with grill lid. Continued to cook pork covered, until an instant-read thermometer inserted into the center registers 145º, turning occasionally. Always take time to clean your BBQ before firing it up, especially for the first time. Marinades tenderize as well as flavor meat. It’s important to season foods before putting them on the grill. Wash dishes and hands after handling raw meat. Don’t reuse the plate that you used for uncooked meat. Use tongs or a spatula to turn your meat not a fork. Prongs that pierce the meat let the juices escape, making the meat drier and less flavorful. Apply barbecue or other tomato-based sauces containing sugars during the last 10 of grilling to avoid burning the sauce. Oil the food, not the grates. The oil burns quickly on the hot cooking grates and becomes sticky, “gluing” uncoated food to the grates. When you oil the food, it keeps the juices inside the food, promotes caramelization and prevents sticking. This is on my Must Try BBQ list for this summer! This is my husband’s favorite way to have a pork tenderloin prepared. He won’t even discuss fixing them any other way. This looks like the perfect warm-weather meal! 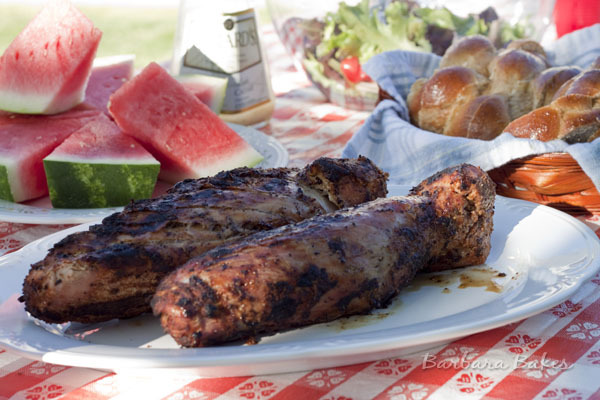 I actually don’t think I’ve ever grilled a pork tenderloin – I need to try this!! We love to BBQ on Memorial Day to kick off the Summer season. Pork Tenderloin is one of my favorite meats to BBQ, but we had ribs! 🙂 Looks like a fun picnic with your boys. I cant wait to meet them. There’s a pork tenderloin that’s been waiting in my freezer for this recipe. Thanks!! 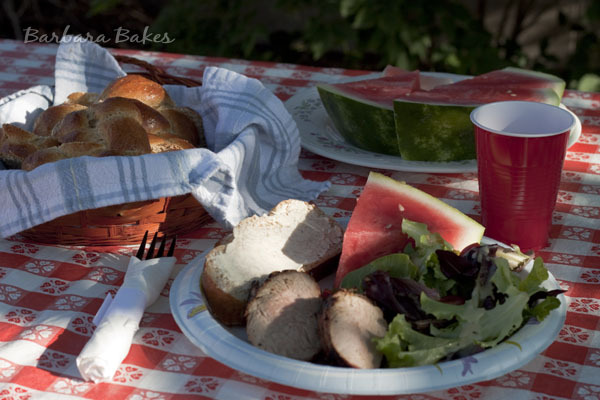 Reading your post was a great reminder to pick up a pork tenderloin at the market. They grill so fast and are SO good. Will pin this recipe for sure! A perfect BBQ recipe, easy and irresistible! Pork tenderloin is versatile and inexpensive. And I can always find a way to use leftovers. I had planned on grilling this holiday weekend, but we are fogged in. Temps in the high 50’s! Pork tenderloin is a favorite on our grill too! This sounds like another great version to try.